Second, Zambia’s trade balance, which has consistently been in surplus since mid-2009, favours further ZMK strength. 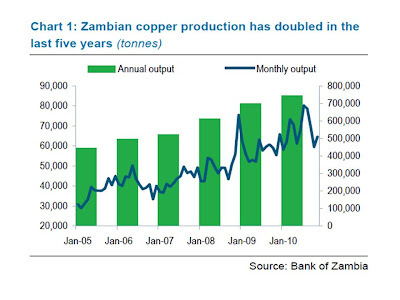 We expect copper output to rise in the months ahead, having already reached 740,000 tonnes in 2010, up from 697,860 tonnes in 2009. 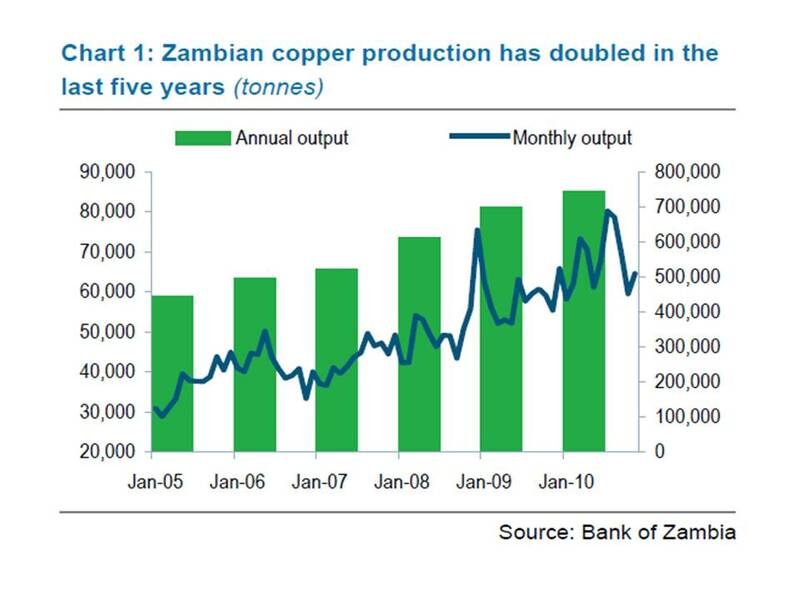 Despite potential downside risks from insufficient electricity production and poor road infrastructure, Zambia aims to meet a production target of 1 million tonnes (mt) in 2012. With several hydroelectricity projects already underway, power infrastructure should become less of a constraint on mine output by 2013, at least. However, this is not just a story of a single commodity. Zambia has achieved record highs in agricultural production too. Maize output has exceeded expectations since 2009. Last year, Zambian farmers produced the highest amount of maize in 22 years, an estimated 2.7mt, with a surplus of 1.1mt – a 42% gain on the previous year’s already impressive performance. We expect a repeat of the bumper harvest this year as the government continues to increase seed and fertiliser distribution. Despite Zambia’s generally conservative fiscal stance, budget over-runs in 2010 were largely attributable to surplus grain purchases by Zambia’s Food Reserve Agency (FRA). The FRA bought the surplus maize at a cost equivalent to 1.7% of GDP in order to export to neighbouring countries, in particular the Democratic Republic of Congo (DRC). Much also remains in storage, to be exported during 2011. However, open-market operations (OMOs) aimed at mopping up excess liquidity as a result of the FRA’s grain purchases were responsible for much of the rise in Zambian yields last year. Interestingly, the BoZ has not been consistent in offering similar OMOs this year, despite the market still being highly liquid. This may be telling. We expect the budget deficit to increase to 3.7% in 2011 due to an anticipated fall in donor financing, higher infrastructure and social spending, and possible election-related over-runs. Overall, the risk of greater domestic debt issuance in 2011 is growing, although talk of a maiden eurobond later this year may curb any rise in domestic borrowing. For now, the apparent halt in OMOs since the new year has meant that there is little pressure on market interest rates to rise. We expect inflation to increase to 10.5% in 2011 from 8.9% last year – a view driven by Zambia’s low inflation base, higher fuel prices and the risk of higher-than-budgeted expenditure. With food comprising 57% of Zambia’s CPI inflation index, the risks to our inflation forecast are to the downside, although the domestic agri-market is regulated, and price smoothing is in place. But given the authorities’ observed reluctance to engage in further OMOs and risk higher interest rates, despite excess market liquidity, their dependence on ZMK appreciation to limit inflation risks is likely to grow. Fundamentals suggest that the ZMK should gain further. The authorities’ broader policy considerations suggest that they will not fight this.